These frequently-asked questions pertain to the Cashogram UK. Data geeks and infographic fans will remember the xkcd ‘Money’ comic and Information is Beautiful’s ‘Billion Pound O Gram’. Shocking and interesting though those are, the numbers used are aggregates, and thus rather hard to grasp. Indeed, it was this that inspired us to find out how much was being spent in more meaningful terms. There’s even an official government version: in March, the Chancellor announced plans to send itemised personal income tax reports to every taxpayer in 2014. In spite of superficial similarities, the government aren’t really offering the same thing as the Cashogram. Since they’re looking purely at income taxes, it’s not a comprehensive audit of national spending, more a sop to taxpayers grumpy at large chunks of their pay packets vanishing unaccountably, and unaccountedly. The Cashogram isn’t about spuriously precise details of where your personal money goes (£329.08 of income tax on defence, anyone? ), but about re-examining our priorities, national and personal, in broad strokes. Who is this median earner, anyway? We chose the median full-time earner firstly because it’s reasonably representative (whether you prefer the mean wage, GDP per capita or whatever, it comes in somewhere around the £25,000 mark) and because it turns out that the tax breakdown for a median earner quite closely reflects the average government spend across the whole nation. In fact, the government spends about 15% less for every single man, woman and child in the UK, so we’ve scaled up the government spending on behalf of the median earner to reflect their true contribution. Can’t you divide anything by the population of the UK and make it sound like a small amount of money? You certainly can, but we look at it the other way around: you can make any number scary by multiplying it by sixty million. Pounds per person per year is the logical way to get your head around services consumed by people, because you can compare them to benefits received by those people given what they spend. The £120bn we in the UK spend annually on healthcare sounds like a phenomenal amount of money—and it is. Even £2000 per person doesn’t make it sound that cheap, until you compare it to £6000 for car ownership. This kind of comparison makes sense in this context (even if, as a result of that comparison, our costly love affair with the motor car does start to look a bit ker-azy). It also allows us to level the playing field between countries with differing populations, or consider shared expenses at other levels, from couples and families, to communities, to the world. This doesn’t mean we shouldn’t put those pennies to good use though, does it? Pennies make pounds, but most of us still disregard them in our daily lives. 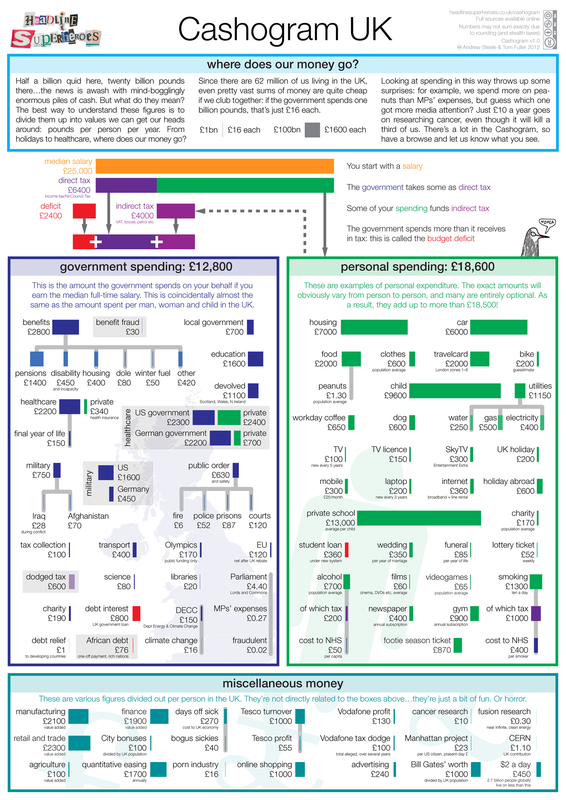 The Cashogram is about the big picture (and it is quite a big picture): it’s simpler to save 0.1% on the military budget than 300% on MPs’ expenses. They’re both 75p per person, but the latter is impossible. But if you think the pounds aren’t being put to good use, do something about it! Not everything is about money though, is it? Money is a pretty big deal: time is money, and money is time, so it’s an indication of how much human effort we’re squandering on a variety of societal ventures, from coffee to libraries. But it certainly isn’t the whole story. Whilst it might seem a bit mad for people like UKIP to get all worked up about the EU for the sake of £120 a year (they could just work on making cars 2% cheaper and get the same saving), obviously there’s also the problem that the EU are making laws and regulating the shape of our bananas*. And money can’t buy you sovereignty, man. Don’t some people pay more or take more? It’s true that some people pay a lot more tax than others, and that others receive more public money. However, questions about redistribution are perhaps for another diagram. The Cashogram is only designed for considering the importance of various priorities funded on our behalves, relative both to one-another, and to levels of personal spending. Isn’t your left-/right-wing approach to this deplorable? We started the Cashogram genuinely wondering how much was spent on what. Continuing in that naïve vein, we used data from publicly-available sources to give just the facts. That said, hopefully we can be accused of both left- and right-wing bias in our selections for inclusion—that would mean we’re showing neither. And that we’d be totally unelectable. What’s with these different versions? Fully anticipating the odd mistake on a diagram with this many numbers, we named the original picture the Cashogram 1.0. So far, a mini-update has corrected a couple of minor mistakes. If you spot anything else, do let us know! Public order and safety spends corrected: police and fire were rather too small on the original diagram due to a bizarrely faulty source. Shetland added to UK map. El Reg informs me that BMI is out of date (http://www.theregister.co.uk/2009/03/17/bmi_rubbish/) and that “obese” people may not be the threat to society that the NHS makes out. I’d be interested in how much it costs to support “obese” folk say 65+ vs non-obese folk 65+ I have a hunch long pensions cost more than death by chocolate. Does the NHS actually keep tabs on this or are they pinning all diabetes and hypertension on fat folk?